Agate gemstones are known for their amorphous, fluid patterns and colors created by the slow accumulation of sedimentary layers. But in the case of the obscure “gems” known as “motor agate” or “fordite,” instead of sediment and minerals, the layers are made of car paint. Pieces of fordite certainly look as though they could have been fashioned deep within some colorful part of the Earth. Largely, though, fordite was created well above ground in the auto plants of Detroit, Michigan. Once these globs were sufficiently large enough to get in the way of the factory line, they would be broken off the bars and skids they were hanging from, and generally tossed away as waste. “Most of the good stuff is already buried in landfills,” says Cindy Dempsey, an independent jewelry creator and owner of Urban Relic Design, who has been working with motor agate for over 20 years. In the 798 arts district of Beijing, China, there is a graffiti store called 400ml who, according to a friend, is manned by a bored young hip-hop wannabe. The store is self described as "China's first graffiti and street culture store." This is only a fraction of the spray paint cans on offer. As early as the 13th century, Marco Polo reported seeing painted velvet portraits of Hindu deities in India, with religious images continuing to appear on velvet canvases throughout the Middle Ages. Transcending time and modernity throughout 14th-century Kashmir, 16th-century China, and 19th-century England, black velvet paintings finally attained full-on cult status in the 20th century. By that point, Jesus appeared just as frequently as matadors, unicorns, hula girls, and, of course, that other King — Elvis. Enter: Caren Anderson and Carl Baldwin, founders and curators of the Velveteria. An oddball museum if there ever was one, the Velveteria keeps the black velvet craze of the mid-1970s alive and well with plenty of retro kitsch—but also a surprising number of new commissions and modern takes on this practice. As lifelong enthusiasts, the pair has amassed a collection surpassing 3,000 of these paintings. In 2005, the museum's first iteration opened its doors in Portland, Oregon where it enjoyed years of endearing weirdness before closing up shop and relocating southward to warmer and sunnier climes. The present collection can now be found in the heart of Los Angeles' Chinatown, where more than 400 of the finest specimens from the couple's treasure trove are on display, six days each week. Though each visit feels a bit like a trip down a rabbit hole in its own right, the most otherworldly element of all is the museum's black-light room, where the ghoulish and trippy velvet paintings really seem to come to life. California-based artist Lexie Lazear transforms her face into works of art with the power of makeup.She was inspired to turn her face into famous paintings, thanks to her love of art. Her intricate designs pay homage to famous painters such as Gustav Klimt, Pablo Picasso, and Vincent Van Gogh. You can visit her website or follow her on Instagram to see more. 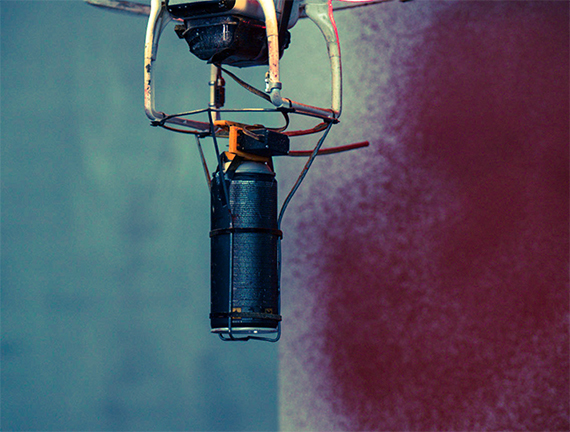 Drones that can be used to spray street art? I love it. This from Hyperallergic - Artist Katsu has been working hard at extending the language of public mark making, and his latest experiments have been drone-based. Long known for his distinctive, large-scale fire extinguisher tags that trail across whole walls, his spray-painting flying machines are the latest evolution of his interest in “things that can make marks,” he tells Hyperallergic. 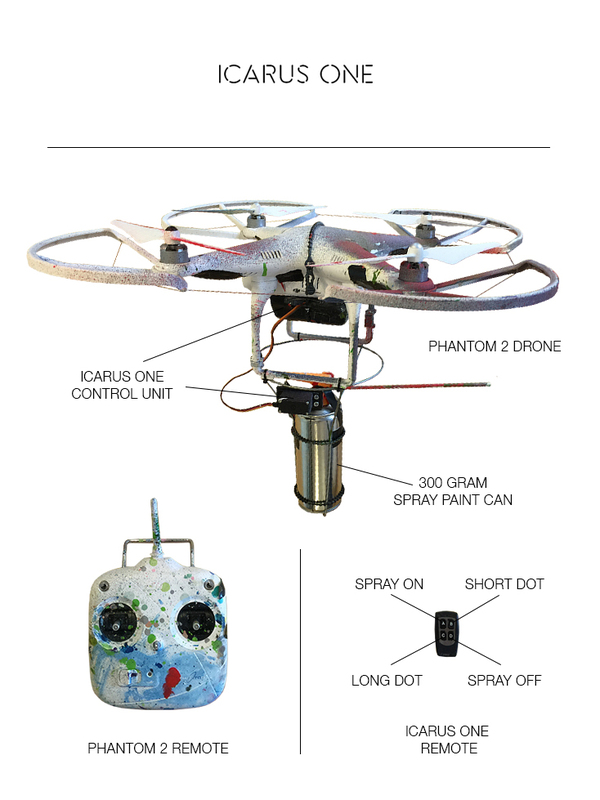 Named after the Greek mythological figure who flew too close to the sun with wings made of feathers and wax, Icarus One is the “world’s first open-source paint drone.” A page of instructions on the project’s website offers schematics to 3D-print your own parts, links to places to buy necessary elements, and even the option to buy one fully assembled. The implication of the Icarus drone is that the function of the artist will eventually be automated after the right program or algorithm is created to propagate her or his ideas and designs. You have to wonder if Katsu’s evolving family of drones, like their namesake, will overstep their limitations. The Greek legend recounts the tale of a giddy Icarus who, overcome by hubris, flew too close to the sun and melted the wax of his wings before plunging into the sea to his death. Considering the illegality of graffiti in most cities and increasingly stringent regulation of drone usage, it’s not hard to imagine the penalties that spray-painting drones could rack up. Designers Eran Shimshovitz and Ariel Zuckerman of the Ariel Zuckerman Studio in Tel Aviv are working on a project that brings graffiti on the streets to the world of furniture-making. Their project called Street Capture combines street art and furniture. The designers attach wooden boards to the walls along hidden streets and small alleys – providing anonymous graffiti artists with a clean canvas for them to work on. After the wooden boards have been filled with street art, the designers take them down and bring them back to their workshop. The wooden boards are then used to create functional furniture like drawers, chests, and tables. According to their submission on Designboom, the designers didn’t tell people what the wooden boards were for because they wanted the street art to evolve naturally as if it were any other wall on the streets and allow the street artists to add their work anonymously. So far the designers have already been able to create a dresser called “Zerifin 35″ after the street address of the wooden board it was made from, a pair of bedside drawers, and a table from wooden boards they installed on street walls. The project is an ongoing series. What will they think of next? One part Holi, one part marathon the annual graffiti run in Miami looks like great fun! The instructions are to arrive in your whitest attire to create a perfect blank slate, then walk, jog, roll, or line dance your way through this delightfully pigmented course. Using nontoxic, corn-starch-based color powder, you'll be sprinkled... okay, blasted with pain-free and glorious color throughout the race until you resemble living tie-dye as you cross the finish line. After the race, make friends with the colorful citizens of our city at the post-5K Color Party with music, food, and festivities. Take the tots away from the tube for an event that will animate the entire family. Sunday October 12, 2014 at the Virginia Beach Key Park in Miami. The NY Times reports on the use of pichacao graffiti by Sao Paulo's artists to express their dissatisfaction with the country's economic inequities. The interesting and ironic aspect of this movement is that Sao Paulo does not allow any outdoor advertising in the city. No billboards. So the graffiti sprayed in black aerosol paint on the sides of buildings is especially noticeable and jarring. Bravo. James Rose is a painter living in NYC and has been painting life on the street, in the parks and on the subways for several years. Since the begining of October he has been drawing the Occupy Wall Street Movement in Liberty Plaza. He has also become an active member of the Arts and Culture Working Group of OWS. He needs to do a fundraiser to accomplish his new project which is to make a large oil painting of Liberty Plaza set before the 11/15 police raid and eviction. It will document the energy of the park and the 24 hour buzz that existed there. The fund raiser will cover oil paint and supplies and also the printing costs of color reproductions of the painting. The New York Times recently reported on Chris Pape, 50, whose street art works from the 1980s decorated an abandoned stretch of subway on Manhattan's Upper West Side. It is the abandoned freight train tunnel under Riverside Park where he began painting huge murals on the walls in 1980. He is inspired by famous artists and often incorporates elements of famous works in his own work. See the photo of Pape's meling watched aka Salvador Dali. According to wikipedia, Chris Pape (aka Freedom) is an American painter and graffiti artist. Pape started tagging subway tunnels and subway cars in 1974 as "Gen II" before adopting the tag "Freedom". Pape is best known for his numerous paintings in the eponymous Freedom Tunnel, an Amtrak tunnel running underneath Manhattan's Riverside Park. Prominent paintings in the Freedom Tunnel attributed to Pape include his "self-portrait" featuring a male torso with a spray-can head and "There's No Way Like the American Way" (aka "The Coca-Cola Mural"), a parody of Coca-Cola advertising and tribute to the evicted homeless of the tunnel. Another theme of Freedom's work is black and silver recreations of classical art, including a reinterpretation of the Venus de Milo and a full train car recreation of the iconic hands from Michelangelo's Sistine Chapel.